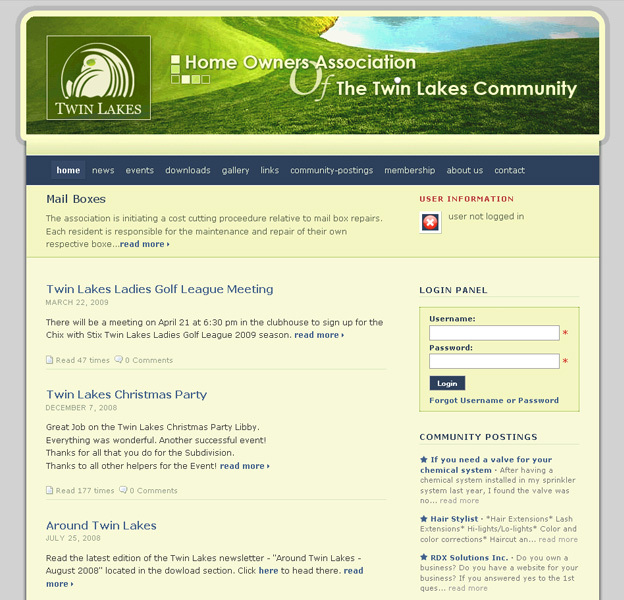 Twin Lakes Community HOA | RDX Solutions, Inc.
Project Description: Twin Lakes Community’s Home Owners Association (HOA) was sick and tried of communicating with its residents using regular mail in the age of e-mail and Twitter. RDX Solutions went to table and designed a custom Content Management System for the community that would allow the HOA to have an online presence and communicate with its members via e-mail and other social networking means. This system also allowed for resident to have their own personal username/passwords to the system to access restricted forms, forums and pay their annual dues. RDX Solutions designed the HOA logo as well and the website is currently hosted under a shared plan on RDX servers.